The North Course at Guadalmina has two loops of nine holes set on undulating terrain. Trees, several lakes and the river, the Rio Guadalmina, can affect play here. Designed by Folco Nardi in 1973, this course runs almost parallel to its southern course. It is shorter and hillier than the south course and has more water obstacles. 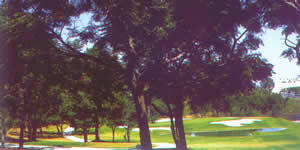 The course was renovated by Global Golf in 2002.